Google is hard at work at making hangouts, the company's chat product, more appealing. Hangouts were previously only available on Google+, but they have since then expanded to other products and even replaced some like Google Talk in the process. Google users can now use hangouts on Google+, Gmail, and mobile devices for example. When you start a hangout, its messages will automatically be saved to the history, so that you can access them again at a later point in time. This not only includes textual contents, but also pictures as they will be saved automatically as well. One issue that some users have run into recently is the 1000 photo limit for hangouts. It means that you cannot send anymore photos to people once you reach that limit. You may get the "Message not sent. Touch to retry" error when you have reached that limit. The limit seems to be per-contact, so that you can still send photos to other users which makes the issue even more puzzling to solve. Google's recommendation is to either turn of the Hangout History, or to delete photos that have been sent in the past. There are other reasons for turning off the history. Maybe you do not want it to be recorded on your computer for privacy reasons. Note: The history is hangout specific. If you turn it off for one hangout, it is still turned on for others. To turn off the hangout history, open the relevant hangout on Google+ and click on the options icon in the interface once it opens up. 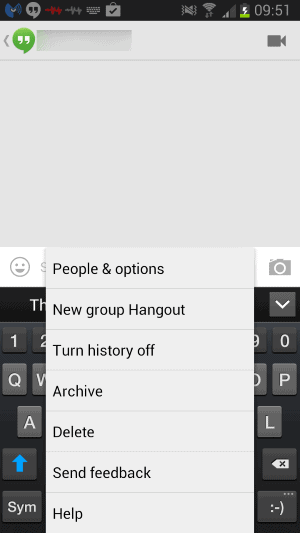 Here you need to uncheck Hangout History to disable the feature for that particular hangout.Make sure you click on the save button to apply the change. Here you can also access the archive. Note that a notification is displayed in the chat window when you modify the history setting. To turn off the history on Android, tap on the menu button of the device and select Turn history off from the context menu to do so. Here you can also access the archive. Messages that are exchanged while the history is turned off will only be visible for a short time in the hangout window before they are deleted automatically. The history may still be recorded by other participants of the hangout depending on which client they use. Side Tip: Saved messages by the feature can be accessed with a click on the chats label on Gmail, or with a search on the Gmail website. This is only available if the History feature is turned on. still trying to work out how hangouts is an improvement over gtalk. lacks simple privacy features, eg – invisible mode, simple turning off of alerts (I don’t count having a solid orange bar telling me alerts are off taking up huge amounts of screen space as a useful function…. 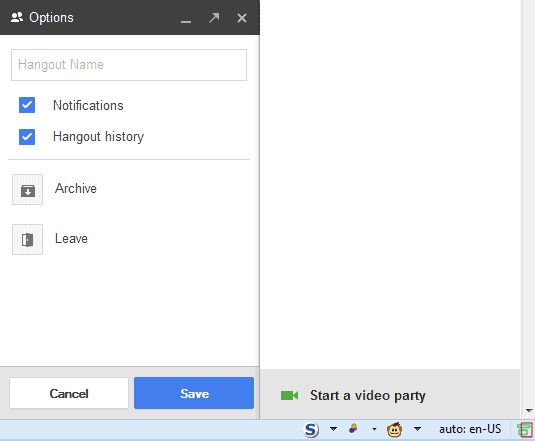 ), also that any user can turn off history for ALL users in a hangout, not just themselves. no file sharing other than photos. no pure voice calling, lack of support for devices that under Gtalk worked fine for voice calls, but “are no longer supported”…. I normally don’t use hangouts as they lag a bit and that isn’t what I am looking forward too. I prefer Gtalk over hangout but this post will surely be helpful to those who use hangout more often. What’s the purpose of turning off hangouts history? My friend just turned off history in hangouts and I just want to know is that a way of saying I don’t what to talk to you anymore.